The Host is Meyer's non-Twilight novel, which trades vampires for aliens and focuses a bit less on romance and more on a story of survival, focusing on a young woman who is among what's left of the human resistance on earth after the world has been taken over by body-snatching aliens. 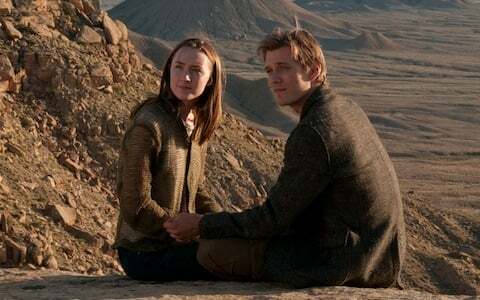 Saoirse Ronan plays the lead character Melanie, who is captured and eventually occupied by an alien "Soul" called Wanderer ("Wanda"). Melanie refuses to abandon her own mind when Wanda takes over, which puts two characters into one body and two separate species eventually growing to understand one another. In case you missed it, here's the new trailer. Spoiler alert: The transcript from the press call with Meyer contains some spoilers from the book (at least one reference to the ending). So if you haven't read it, keep that in mind as you read on. What's more fun, aliens or vampires? Well they each obviously have their appeal. I don't know. Strictly fun - you can have a lot of fun with vampires. There's just a little bit more of a - I don't know what the right… I don't want to say goof factor because obviously they take themselves very seriously. But there's the whole super hero aspect. They have different abilities. They can run fast and lift heavy things. The aliens are limited to being very human. So I think, just purely on fun, probably vampires. But the aliens, to me, feel like a more realistic fantasy. What do you think, in particular, will appeal to the Twilight fans about The Host? I feel like, if they like my style of storytelling, that is still the same. The story is very different, but there's always going to be romance. I wrote it, so there's definitely some romantic scenes. But there's also some really stellar performances. You've got to see William Hurt as Jeb. It's just really awesome. And Saoirse - she's not a household name, probably because no one can read her name right now. They will though. She's unbelievable. Just to watch her get to do this great of a performance where she has to play two people and really run with that is worth the price of admission for sure. Is there anyone from the movie - any of the actors - that pulled off the performance that you think is really closest to how you pictured the character when you wrote the book? Yeah, all of them did a pretty great job. The top honors have to go to Saoirse, particularly for her portrayal of Wanda. I think Melanie was a little bit easier for her because she kind of relates to that girl, but Wanda's not even human. And wow, does she create this person, this entity. And it really did, for me, most encapsulate this character, who really could look like anyone. So the looks aren't such a big thing, but she just has that other-worldly persona, where she is just alien. It's amazing. I was watching the Google Hangout that you did earlier. You mentioned a couple of things. One of them was that you were working on a new project. You didn't get into any specifics on that, only that you were trying to veer away from anything that involved eyes. And the other thing was the possible sequel to The Host. Can you talk a little bit about what you have in the works and when we might expect to see another book? Yes, I'm working on the sequel to The Host. I have no idea when it will be done. And when I say it's done, then I still have to do the editing process, which can be extremely long. It's going really slowly right now and I have this Host tour coming up, which I know is gonna - I can't work on the road. I'm really awful about that, but I cannot get the focus I need when I'm not having large amounts of time. I mean, it's not being on the road, it's being interrupted every hour. So I don't know how long that's going to take. I would love to get that knocked out this summer, but that's extremely unlikely. I'd have to cryogenically freeze my children. And my husband. And if someone knows how to do that, call me. As far as the other project I was talking about, that was Down a Dark Hall, which was my favorite Lois Duncan novel as a child, that we optioned a while back. We're working on the script. It came up, just a little thing with a special effects on the eyes, and I'm like, "Nope, no eyes. Can't do it." Since you've had such success, does it change your writing process to know that anything you write can potentially become a film? You know, it changes my writing process more with the idea that what I write, someone's going to read, and that actually really slows me down. I did a lot better job writing quickly when I could lie to myself and say, "Well no one's ever going to see this but me." That's a very helpful tool for me. If I could convince myself that that was the case, I think I would be able to do it more quickly. But I second guess myself a lot, knowing that people are going to see things. As far as the movie element. I don't think that it affects me so much - Every now and then, it is true that I've kicked around the idea, I have this novel way on the back burner. I mean, it will be forever until I can get to it. But I like the idea of it because it's impossible to film. I just don't think you can do it. That actually does make it kind of intriguing. You couldn't do this [story] as a film. I guess there's something freeing about that. What's the biggest change you've gone through as an author when you look back at things you've written and think, I wouldn't write that this way, now. I hope I'm better. [laughs] I hope that I've gotten stronger as a writer. I look back at things and when I reread my stuff, I always find so many things that I would do differently. It's not so much in the story, but just in the way that I say it. There's words, I'm like, "Oh, I wish I wouldn't have put it that way. I wish I had taken that sentence out." It's really easy for me to second guess myself. That's one of the problems of knowing people are going to read your stuff. Once it's printed, you don't get to make changes anymore. For some of my other author friends that I've spoken to, that's a hard thing for a lot of them. Once it's out of your hands, then all of a sudden it's written in stone. You can't make those changes you still long to make. It's very, very hard. Are there going to be any major changes from the book to the movie? The major change is that we just had to cut out 500 pages, basically, of the novel. And so, it's definitely streamlined down to the essential relationships of the core story. Aside from that, I feel like it gives a very true vision of the world. The characters that are the main characters are very much translated into themselves. I don't feel like they've transformed into someone else. Visually, I think it's actually a little heightened. Because in my version of the story, there wasn't that much of a change on the planet earth. It still looked a lot the same. But Andrew is such an incredibly visual person, and a genius. And so he came into it and made the Soul world just a little bit different from how the humans are. People dress nicer. They're cleaner, Everyone's a little bit shinier. There's a slightly different feel. It's still obviously planet earth, but not quite the place you can walk into and fell like you're a part of. And I thought that was brilliant. I really loved it. Can you tell us why you chose to take on aliens? Aliens are much more my roots than vampires, for sure. I grew up reading science fiction and fantasy. I never really read horror. Before I wrote Twilight, I never read a book with a vampire in it. So that was very… not my realm. Whereas aliens, I feel totally comfortable with. I love aliens. I've always been drawn to alien movies and alien stories. I love that. So for me, that's just a place I like to hang out. You touched on this briefly before. You have some wonderful veteran powerhouse actors in this film, such as William Hurt playing Uncle Jeb and Frances Fisher playing Maggie. Can you talk about what they bring to the movie? So much. Oh my gosh. It's really amazing. Frances Fisher has a smaller role than William Hurt, but she's really fantastic in everything she does. But William has a meatier role, and he gets to the thoughtful center of the movie. He's the person who's been around the longest and seen the most and comes up with his own philosophy on life. Every time he's in a scene, it's like "Ahh" angel lights descending on it. It's amazing. I think people are just going to adore him as Jeb. I think that might be the most true to the novel, looks, the sound of his voice, the way he does things. I think people are going to be like, "Yes, there's no one else who could ever do this but him. On the other end of the scale, aside from veteran actors, you have a very young actor, Chandler Canterbury. You recently, in Twilight were working with another young actor, Mackenzie Foy. And now you have Chandler in this, who has another key role. Can you talk about what this young performer brings to the film? He's fantastic. We've been so lucky. You know what they say, never work with children or animals. We keep doing that, but both of those two young actors - who have actually worked together before - we ended up getting these little adults who are very serious about their craft, who completely understand what they're doing. It's not the situation with the stage parents, these are kids who genuinely love acting and really enjoy it. And Chandler, he's adorable, but he's also really, really gifted. You just buy him and his feelings. They're there. And there's this scene with him and Wanda, and just the relationship between them feels so real. I remember, Andrew was just amazed. He was crying in this scene, and he's like, "It's like that kid can actually control his teardrops and make them stop on his cheek at the perfect spot." He's extremely talented and it's wonderful to have. In this post-apocalyptic world, where everything's very serious, to have a child, it puts everything into perspective. For me, as a mom, it makes you take their situation so much more seriously, when you see a child suffering in this world that they live in now. So I'm really grateful that we found someone and that he wanted to do it, because he's amazing to have. What characteristics did Saoirse embody as an actress that you felt was perfect for the leading role? The main thing is that she is one of the most amazing actors I've ever had the privilege to watch, let alone work with. We knew that with this role, it's very complicated. And without someone who could just transform themselves into both of these characters and be super believable, it wasn't going to work. We had to have an amazing actress. So that was the main thing, which was finding an actress who was that good. Then, when you get past that, her abilities that are special to her - one, is that she is so ethereal. She's such a down to earth kid when you know her, but if you see a photograph of her on a red carpet, it's like she's from another planet already. She's just this beam of light. She's amazing. That worked out so well, that otherworldly part of her, to play an alien, a very peaceful alien from an advanced civilization, it's very believable. Because she is just different. She's not quite like us. And then, she also has the ability to play such a fierce survivor. If you've seen her in Hanna, you know what I'm talking about. And that, actually, was the movie that the other producers got me to watch. Because my first instinct when they said Saoirse Ronan, I was like, "Too young. I don't want to do this teenage triangle again. It's going to be too much of a Twilight thing…" I was kind of an absolute no, she's fantastic, but no. And they said, "Go see her in Hanna," and so I very begrudgingly did. And I was sure my mind was not going to change. And I was on the phone with them before the credits were done rolling. I was like, "Ok, ok. Sign her up. If she's willing to do it, do anything we have to do to get her." [laughs] She's amazing. I truly believe she can do anything. I can't wait to see what she does next because she is so phenomenal. The underlying kind of message in your stories really have to do with love. Can you talk a little bit about what message you want the audience to receive with The Host? I never purposely put messages in my stories. I'm just always trying to entertain myself and then afterwards I'm like, "Ok, maybe that's what I was thinking." But with this one, if feels like it's very much about love, but not romantic love. Definitely, romantic love is a part of it, but the full spectrum of love. You kind of get to explore the love you have with your people and the place where you belong and how that changes when you find a new place. There's a betrayal aspect to this. The main character is a truly good person who has to betray other really good people and that's a big deal. And there's also the mother love that she has for this other person's brother that she feels really tied to. And being able to work some of those themes of motherhood in. Because that's so much a part of my life, it felt important. And then you also have sister love, which isn't something I've gotten to do much with.And I have two sisters that I'm very close to. Her relationship with Melanie starts out very antagonistic, becomes the most defining relationship of her life. She's willing to sacrifice everything to give life back to a girl who becomes her sister. It feels like a spectrum of love and you get to explore so many more angles than you do if you're just doing a romance. Aside from the Cheetos eating scene hitting the cutting room floor, what couldn't make it in that you found the most gut-wrenching as the writer? Some of the characters - Walter doesn't exist in this story. And that's what my mom gives me the most grief over, because she loves Walter. He was hard to lose. A lot of the minor characters - some of them appear in the movies but don't even get to be named. It's really hard because so many of these little side stories, playing soccer, to me, they mean a lot because it's these pieces of real life. And we couldn't have the playing soccer scene in the movie, which is a little minor tragedy like it always is when you adapt. You lose this thing that you really would have loved to see. But in the end, there's a level of realism that you have to get to when you have a 600 page book to adapt. You know you're going to loose 5/6 of what you've done. And then it's just, what are the most important things. And I think that Andrew did a really Stellar job of nailing that. He got the really important things. The core and heart of the story are there, and all of the elements that are in the movie from the book are very true to the book, so it feels familiar and right. You could have set this alien invasion tale anywhere, what made you want to set it in Louisiana and the desert in Arizona? It was never set in Louisiana in the novel. That was something we did in the movie that ended up being a really good choice. Louisiana is the place to shoot these days. They've got the facilities and it just makes the most sense on your budget, generally. We could have. That part of the story takes place, some of it in San Diego and some of it in the southwest. We decided to embrace the location, rather than trying to hide it and pretend that we were somewhere else. And it ended up being fantastic, because we were able to really celebrate the unique, beautiful things about that area. And then we shot the desert part in New Mexico. We got some really stunning locales. We were really fortunate, it's so beautiful. The things I chose in the novel, when I wrote my other series, a lot of it was about fantasy for me. So I wrote that I'd actually never been to. I'd always wanted to grow up in Washington. I thought that'd be great. The rain and green, they have stream beds that have water in them instead of them being full of rocks. I was always fascinated with that world because I grew up in the desert and that was my home and that's what I was used to. When I wrote The Host, it is about my home in a lot of ways. It's a place that I know and that I'm comfortable in. The story is closer to home for me because it is my genre. I like science fiction. That's my favorite world. So I also set it in my physical world that I live in. It felt like the right thing to do and in some ways it's more personal for me. There's a very unique love triangle in the story. Almost like a love square. Can you talk a little bit about where you came up with the idea to add in that fourth element? The love triangle was actually the beginning thought that lead to the novel. It was the idea of two people in one body in love with the same person. A jealous triangle where you could not escape the other person. You couldn't separate yourself from them. Turning it into what Jake Abel calls the "love box" instead of the love triangle really came about because of his character. When I originally outlining the story, and first working on it, I had pictured a bittersweet end to it where Wanda's still in love with Jared but she's doing the right thing for her family and how things should be done and she's sort of living in this sacrifice, which would have been great. I probably should have written it that way but I have this happy ending problem. The character of Ian was not supposed to be a main character or have anything to do with romance in the story. But, I just couldn't… he was supposed to be the bad guy but the character kept thinking about, "But why is it fair to treat her this way? She hasn't done anything to us personally?" He just matured a lot and kept asking questions, which doesn't make a lot of sense, except to other writers. They know how these characters kind of come alive and don't always do the thing you want them to do. So the character became interested in Wanda as a person. And because she's such a good person, it was kind of inevitable that he would fall in love with her. So that just sort of happened in the course of the writing. I really do love the characters that develop themselves almost separately from you. I don't have to do any work with them, they're very easy. That's how it ended up being a love box. Because Ian was a thinker. The Host arrives in theaters March 29, 2013. More information, photos and videos from the film can be found in our Blend Film Database.